Nine years after the first post-Taliban UN talks on Afghanistan were concluded in Bonn, one border province is still left oddly isolated. ‘You're right, no troops based there,’ he says. ‘And I’m realizing now that there’s not a PRT (Provincial Reconstruction Team) in the area, either.’ I ask him why none are stationed there, but he doesn’t have an answer. Neither do the experts. In fact, there is the 2nd Marine Regimental Combat Team in Delaram, a small town that lies on the furthermost spot from the border and the province´s capital, Zaranj. 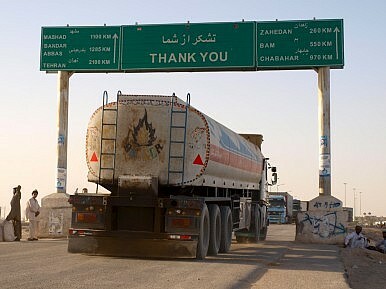 But Afghanistan´s south-western, porous border remains unguarded. ‘Nimroz is a major smuggling hub in Afghanistan: heroin goes out and weapons get in across the Afghan-Iranian border,’ says best-selling writer and renowned Afghanistan commentator Ahmed Rashid. He says he has no explanation for the ‘military abandonment’ of this remote, but potentially key, southern province. Perhaps not surprisingly, there aren’t any direct flights from Kabul to Nimroz. To reach the provincial capital of Zaranj, you first have to fly to Herat, in the west. From there, an obsolete Antonov flies three times a week (if you’re lucky enough to catch it on a day when it hasn’t been grounded for mechanical reasons or one of the frequent sandstorms). A couple of wrecked aircraft at the end of the runway at Zaranj Airport are an uncomfortable reminder of how unpredictable the conditions can be in this part of the world. Nimroz is unique in many ways. For a start, it’s the only province in Afghanistan to have sent two women to serve in Kabul’s parliament following September’s parliamentary elections. It’s also the only part of the country where the minority Baloch make up a majority of the population. Indeed, the province’s governor, Karim Brahui, is a member of this stateless ‘nation,’ which is now divided up between Iran, Pakistan and Afghanistan. ‘There aren’t any foreign troops deployed in Nimroz because there’s no need for any. This is a peaceful province,’ Brahui says. Certainly, he’s someone who knows first-hand the difference between war and peace. The governor was the founder and a former commander of the ‘Nimroz Front,’ which was established in 1979 and fought both the Russians and the Taliban. While much has been written about Ahmad Shah Massoud, the Tajik Northern Alliance commander who is given most of the credit for the defeat of the Soviet Army in Afghanistan, little is said about the efforts of a ‘Southern Alliance’ battling at the opposite end of the country. ‘We had no contact with the movements in the north, but we all pursued the same goals: to fight against anyone who would invade the country,’ Brahui says. The former weapons mechanic and now central government minister for refugees says that far from disappearing, the Nimroz Front is still active.